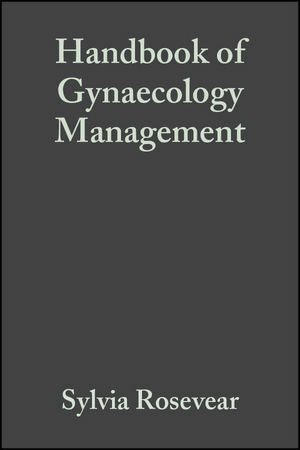 This is an easily accessible guide offering advice on all gynaecological conditions and treatment. It serves as a companion text to Handbook of Obstetric Management, also edited by Sylvia Rosevear. This comprehensive text provides information on conditions and treatment modalities. It reflects the current evidence base as well as expert knowledge, and includes contributions from a number of specialists within the field. Sylvia K Rosevear, MD, FRNZCOG, FRCOG is Consultant Obstetrician and Gynaecologist at Gilgit Road Specialist Centre, Auckland, New Zealand. 1. Hormonal Contraception and Sterilisation. 3. Cervical Screening and Pre-malignant Disease of the Cervix. 5. Infertility and Assisted Reproductive Techniques (ART). 6. Ultrasound Imaging of the Pelvis. 8. The Menopause and Hormone Replacement Therapy. 11. Endometriosis and Chronic Pelvic Pain. 12. Vulval Disease and Gynaecological Dermatology. 14. Gynaecological Oncology and Pathology.